President Bill Clinton's My Life is the strikingly candid portrait of a global leader who decided early in life to devote his intellectual and political gifts to serving the public. It shows us the progress of a remarkable American, who made the unlikely journey from Hope, Arkansas, to the White House. President Clinton's audiobook is also the most concretely detailed, most nuanced account of a presidency ever written, encompassing not only the high points and crises but the way the presidency actually works. It is the gripping account of a president under concerted and unrelenting assault orchestrated by his enemies on the Far Right and how he survived and prevailed. Here is the life of a great national and international figure, revealed with all his talents and contradictions, told openly, directly, in his own completely recognizable voice. ©2004 Bill Clinton (P)2004 Random House, Inc. Random House Audio, a division of Random House, Inc.
A very good book. I enjoyed the honesty of the story of his failures and his flaws. The book outlines pretty well the nastiness and pettiness that is politics. Clearly Bill Clinton was born to be President and worked all his life towards that goal, even if early in he didn’t know it. The outline of the family struggles and the imperfect childhood help explain the man and his story. A very good read. Clinton is smart, and although I wasn't expecting a "scholarly" work I was expecting something more substantive from a Rhodes Scholar. Those who are easily impressed with vast quantities of facts will enjoy this book. But the sense I have from listening to the book (and Bill Clinton is an excellent reader, by the way) is that he simply "Googled" his life and has given us the descriptions that one finds for every link on Google. I know that Clinton jogged a lot, I know how often he jogged, I know how many miles he jogged, I know the exact jogging routes he took. What I didn't learn from this book is why he jogs, what jogging does for him, how jogging makes him feel, what he thinks about when jogging. Nor did I understand how he could jog every day during the first primary season and gain 30 pounds. It's this style I found disappointing. Full of facts, bereft of substance. 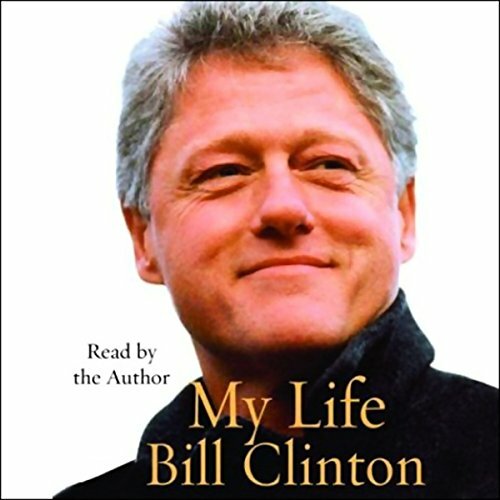 "My Life" gave me the sense that Bill Clinton has come gained an intimate understanding of who he is and how others' lives have impacted him and how he has impacted others' lives. I wish he had shared that intimate aspect of his life. His narration was good, and it was easy to listen to. It's good to learn about the scandles, and family affairs from their own perspective, and his battle with white house corruption and right wing scandles were disturbing but interesting to listen to. I wish I had gotten the unabridged because the abridged version is too short and I felt like I hadn't gotten the full picture of his life and work. I found Hillary's book to be more fulfilling in that respect (abridged). I believe, like many other reviewers here, that Bill Clinton is capable of writing a more engaging and insightful book that this one. It is very fact- and time-based but rarely offers the deep personal reflection on events that one hopes for in an autobiography. That said, however, it was interesting to hear all the details about Clinton's career and family in his own words and I would recommend this book to anyone who is interested in learning more about his life. A large number of reviewers and people seem to have reduced Clinton's presidency to the Lewinsky affair and wish he would have spent more time on it. I, for one, was delighted that he discussed it in limited detail and tried to keep it a personal matter between him and his family. Don't look here for salacious details and hysterical rants about the affair. For that go to the Starr report or Lewinsky's own book. I like his approach very much; not placing blames, but simply describing events from his perspective. It is a great book for anyone to read, or listen. Highly recommended. I was interested in this book because of the many interesting speeches I'd heard Fmr. Pres. Clinton give. I'd found him to be a good speaker, he did his homework and it usually showed. What I found engaging was his sense of humor and candor. I'm new to audio books and I chose the abridged version for fear of boredom and found that while it was interesting to listen to, there was so much ground to cover that I think his witticisms and sense of humor were cut out in order to cover it all. So, if your interested in hearing some "behind the scenes" stuff, this book is great. But some of the humanity of Clinton is left out and it suffers for that. No matter what you think of Clinton's politics, the book is engaging and entertaining. His narration is excellent, like chatting with an old friend. This is the kind of book really enhanced by being heard instead of read. I have to admit Bill Clinton's candid review of all his political decisions made during his presidency is very persuasive. I have been a typical guy who naively followed media's picture of him, but his review of political action by action, changed my view. If we have not seen anybody from Repulican side rebuke his book, I have to say Clinton was more right than his Repulican adversaries during his years as presidency. He shows his humanity in that he doesnt villify his political opponents, but only shows why they were wrong policy-wise (as opposed to them always arguing that he is "evil" and "ungodly"). Clinton doesnt spend much time settling scores, and instead spends a lot of attention on why his policies worked and why current Bush policies fail so miserably. And the stories of his childhood flesh him out so well. Highly recommended for both those interested in policy, and those interested in this fascinating foibled man. It is a must read for anyone in politics, that includes Republicans. Nice to hear about "his" life. Its great to hear the president read his own book-you know he'll give his personal inflection to eliminate misunderstandings. Plus, it's like listening to him in person.